Are now been sent out via email to any of those on this forums that are also battlefield players. Open beta starts tomorrow for everyone else. Feel free to download it and try it out. 7.2gb for PC and 6.16gb for Xbone, I don't know ps4 as of yet. leave this horrid place! titanfall franchise has past away,go play battlefield 1 beta...only 7.5 gb download! Haha i was about to do that... good reports some far ive heard..
Lol, Go to their official forums and you'll see them singing a different tune. That forum looks exactly like this forum with all the so called Loyal Veterans flooding the site hating on everything about the game so far. I'm a Battlefield player and I have to admit that I had way more fun with Titanfall 2 than I'm having with BF1, which is a disappointment Cuz I was excited for BF1. I think you meant to say COD mech attack will be your go to. No, he's mature. He meant what he said. Nice, an actual off topic thread in the off topic section. I tried that once! It's funny how people on here criticize Titanflall 2 for being slow and how it rewards camping but then they go and praise Battlefield 1 lol. I think that's because Battlefield has always been slow paced and the maps are huge so sniping is a valid play style for Battlefield. In my opinion Titanfall 2 doesn't feel that much slower, and well...campers are going to camp. It's a shame to have seen so much camping in the tech test but i think once the game actually releases players will realize what they are missing out on by not using the mobility Titanfall offers. True, but a lot of those people also went on to say how making Titanfall 2 slower and campier made it easier and require less skill to play. These were major reasons why they didn't like the game. 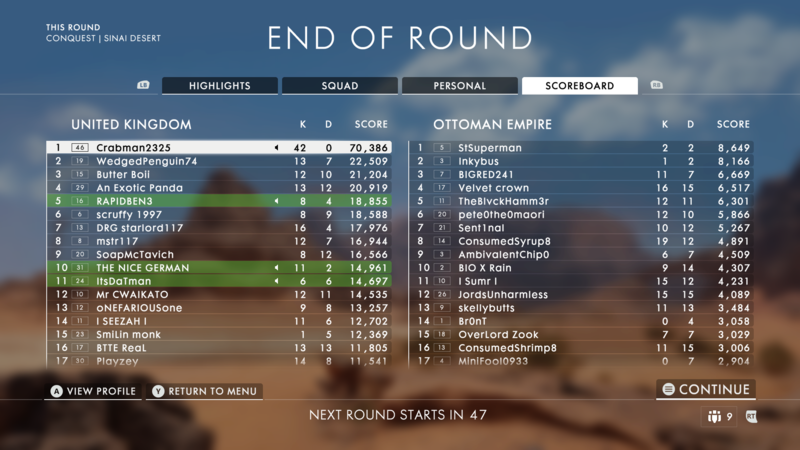 So, I don't understand how a game like BF1, that is definitely slower and has a lot more camping going on, would appeal to them more than TF2 right now. I know people play different games for different reasons but that just sounds a little ironic to me. I agree, I don't think TF2 felt that much slower than the first game either. I heard somewhere that somebody did a test between TF1 and TF2 pilot movement and the speed was virtually the same. What really hindered the pilot movement in the tech test were the designs of the 3 available maps and the lack of wall running areas in them. Respawn did say there are other maps that will allow for more wall running in the full game so that should make some people happy. I also think that there were a lot of campers in the tech test because it was an open test. There were a lot of noobs to the series and noobs tend to camp. If it was a closed test with mostly Titanfall fans I'm sure there wouldn't have been nearly as much camping. I agree that when the game releases there will be a lot less camping too. Either way, mobility is still king in TF2 and players who are better at moving around the map are almost always going to do better than players who sit in one spot most of the match. Game is fun as and it's only the beta! So, I don't understand how a game like BF1, that is definitely slower and has a lot more camping going on, would appeal to them more than TF2 right now. Because it's still Battlefield. They didn't take battlefield and then make it Titanfall. Like Titanfall 2 took Titanfall name and made COD 10.0.8.91/ Overwatch/Heroes/Halo. I'll buy Battlefield just to spite what this new Titanfall, the developers, the social media team and anyone who had anything to do with it did to the name Titanfall. Then I'll make sure all my friends and family get Battlefield too. As will most people on these forums who are still getting diddly squat official replies from Respawn. Then I'll make a support group to those who were as emotionally invested in the new Titanfall as I was, and we'll track every single employees career, making sure we boycott everything anyone who touched this game ever works on in the future. That sir, is why Battlefield is appealing, because it's still Battlefield. Any still not sure about bf1? That image looks way more fun than the entire TF2 experience combined. I've just made up my mind, I'm definitely getting Battlefield instead of TF2. Thanks crabman! Yes, still Battlefield, but still slower and campier than TF2. I was only pointing that out in regards to people who said they were getting BF1 instead but also that TF2 was awful because it was slower and encouraged camping and games like that require less skill. I wasn't referring to everyone who said they liked BF1 better or were getting BF1 instead of TF2. You seem to take everything out of context. By all means, please buy BF1 instead of TF2. Will you also leave these forums and take all of your other accounts with you? bro, they are making a sequel because they are a game designer studio. And TF was a big new IP. The reason they made changes is simple really: they believe this will bring in more players; hence increase revenue. Anyone remember the wardrobe malfunction back in the day? That there was thousand, upon thousands of letter send to FCC? Well, turn out it was a handful of people that created those letters. The rest of us didn't care. Or anyone remember when MW2 first shown, COD4 vet flooded the forum with negative shiet.. Me included..hahaha. MW2 turned into 1 of the biggest entertainment released. Or when MW3 release, MW2 vet also flooded the forum with negative shiet... Me included. Though after MW3, i gave up on COD. MW3 turned into #1 biggest COD release. All Im saying is they want to make $. TF1's model didnt make $. So they have to make some changes. You see all those medieval time dress-up pretender on college's campus? Or those hippy clans? Or those emo groups? Sure they stand out among the crowd. No, just you and your 3 or 4 other accounts (or however many you really have) that you use to like and agree with most of your comments. You know, the same ones you've used to unjustifiably flag a lot of my posts with too. I have no problem with any posters who dislike the game as long as they are civil and not condescending like you are. If anyone else flagged your posts, that's between them and you. Did you ever consider maybe, just maybe, your posts were flagged by people who actually think you were deserving of said flag? No, because they weren't deserving and were flagged as retaliation for me validly flagging 2 of your posts for being spam. You're flagging my posts saying they are off topic, spam, or abusive when they aren't. You're only doing it because you're upset that I flagged 2 of your posts. Also, it's you and the same 2 accounts flagging a lot of my comments at the same time. These accounts barely have any posts and the ones they have are either agreeing with your posts or defending you against posters who disagree with you. These 2 accounts seem to think that a lot of your posts are very "insightful" and "awesome" too. In your last thread you mysteriously disappeared when people started ripping your argument apart but then a new poster with only 6 posts (5 of them in that thread), who also talks a lot like you, just shows up out of nowhere and starts defending you. It's pretty obvious you have other accounts, man. Another poster even accused you of it before. Other people suspect it as well. Well, when you make posts saying things like, "a lot of people left Titanfall 1 because of me and other players who are sooo good we made them quit", "PS4 player opinions on the game are irrelevant", and refer to yourself as "god", that is extremely condescending. The first time you ever responded to me you told me that I was a liar and I needed to educate myself lol. You say things like that, you constantly derail threads, and you spam the same opinions over and over again in new threads instead of putting them where they belong. You deserve almost every flag you get. LOL Maybe I have multiple accounts too? Nope, I don't need other accounts to like and agree with my posts and defend what I have to say. So, in the same way I don't think my posts deserved to be called spam, you don't think yours do? Ironic. Cool man, funny how you don't seem to be making the allowance for me not replying because you, hsarb, doctahbubbles and several other accounts who defend the game and how great it is in every thread turned the thread into what moderators think became personal attacks and what I feel became spam to get the thread closed, thus I couldn't reply. On top of that you still don't allow the room for others to genuinely agree with me and think their lack of posts mean the account must be mine. It's funny, because the account you're talking about, was just another fan, who I've never knowingly played or met, feels the exact same, as do 1000s of others on these forums, and now your tactic is to call them my accounts. How funny it is. Well, when you make posts saying things like, "a lot of people left Titanfall 1 because of me and other players who are sooo good we made them quit", "PS4 player opinions on the game are irrelevant", and refer to yourself as "god", that is extremely condescending. Awesome man, guess the truth hurts. Maybe if Respawn had played with gamers talking about this in actual game lobbies, they'd have known the real reasons people stopped playing their game and the reasons people are still playing their game. The analytical person in charge of making the decisions was a clueless, 100% clueless non gamer. The first time you ever responded to me you told me that I was a liar and I needed to educate myself lol. You say things like that, you constantly derail threads, and you spam the same opinions over and over again in new threads instead of putting them where they belong. You deserve almost every flag you get. Oh, so you mean like the way you, hsarb, doctahbubbles and a few other accounts members can clearly see are nothing but empty accounts consistently doing the same to any members thread that says anything critical of the game? Members only need to see the empties by looking at posts by the likes of you or those I've mentioned, see the massive community off-topic or awesome votes on the posts, then the half a dozen of you who vote the opposite way. I'm done replying to you. I'm not wasting another second reading/replying to posts by you or others accounts I've mentioned, as you have nothing to say about why the game is good. The community overwhelmingly agrees it's not. If you actually want to reply to a discussion and leave the hate at the door, I'm open to it. Try this thread. However if you wish to continue to think I have the time to run multiple accounts instead of realizing other people genuinely agree with me, well there's nothing I can do to help you and this will be your last post I read/reply to. Just avoid this guy. Right now I'm @ about 45 neg/ 80 pos in feedback. Over a quarter of my negative strikes are from him, with IncomingTitan and SlamMetalJesus tied for second at 6 a piece. I only got on the forums after playing the Tech Test and wanting to spread the word about this game that I really enjoyed. He is simply a troll. If you feed the troll he will never leave! I am no longer going to be posting replies to him. Only feedback as is appropriate. Want to see the very last olive branch I offered? Check out this thread where he even calls some of us out by name *gasp*! Think I was being unreasonable? I would really like to know. Try not to drown in the salt, people. Bf1 beta is now over. You right, you right. I tried the beta and I have to say I was not impressed with BF1. Infantry seemed very slow, squishy, and clunky; same with vehicles. I know it's supposed to be WW1, but my pause screen shouldn't lock me out for 30 seconds while it load either. Sorry bud, didn't mean to feed the troll and derail your thread. This is what Meltinzone does though. He follows my posts and harasses me. I'm done responding to him in here though so things can get back on topic. How so? Slow in comparison to Titanfall or in general? Did you adjust your FOV slider? The menu screen was a bug that got addressed in the last beta patch and should be alright for gold build.